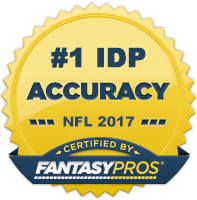 This said, I've decided to do a mini-series on some of the more intermediate IDP stat categories over the next few days. We will take a look at player participation data, tackle frequency, sack frequency, and points per snap. These resources will live on the site leading into the start of the season, so that we can use them as a guide to help inform our 2014 draft decisions. The IDP snap count data is available after the jump. There are separate tabs for DL, LB, and DB to make filtering through the data easier. Players needed to have 300 snaps or greater to be included within the data set. NOTE: The data is being displayed on the site using an embedded Google Document. Some readers may have issues viewing the tables depending on a myriad of different of factors (e.g. browser, device, method of viewing). This said, I've made the data available in downloadable spreadsheet and PDF form as well. See the download links below.